Tyus Battle looks to drive against Florida state. Mandatory Photo Credit: Initra Marilyn, The Juice Online. No. 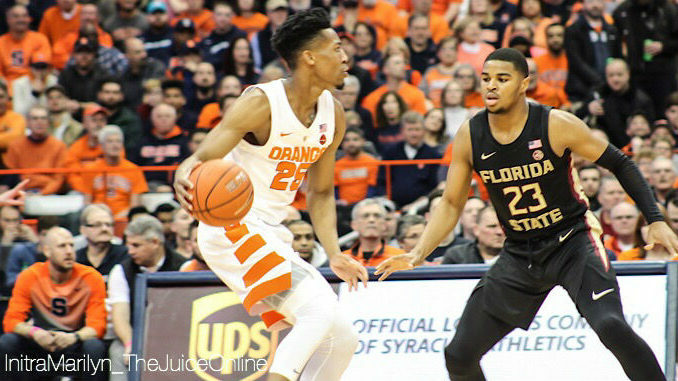 22 Florida State held on to defeat Syracuse 80-62 at the Carrier Dome on Tuesday night. The final score does not illustrate how close this game actually was. SU fell behind by as many as 22 points in the first half, but rallied to pull within two points in the second before FSU put the game out of reach with a late 12-0 run. Both Pascal Chukwu and Frank Howard had forgettable games for Syracuse last night, combining for 32 minutes and zero points. Howard may have had his worst game of his Syracuse career, not only going scoreless but failing to get an assist while turning the ball over three times. Coming off a 15 point game against Pittsburgh, this performance is a cause for concern for Howard. At this stage in the year, it is a telling sign that your top two seniors are wildly inconsistent and on any given night, could no-show a very important game. It’s no secret that Boeheim coached teams play with a short rotation. The Orange showed a lot of heart in this one but the numbers game caught up to them at the end as FSU pulled away. Syracuse typically goes on a seven man rotation whereas the Seminoles have ten players who average 11 minutes or more per game. The silver lining to SU’s depth woes was the press defense appeared to work well for them. To end on a positive note: “The big three” on offense shined last night, keeping Syracuse in the game for the majority of it. Oshae Brissett had another double-double last night scoring 16 points and 12 rebounds against the Seminoles. Nine of his 12 rebounds were in the first half which helped ignite the Orange to their comeback late in the first half. Battle bounced back as well, after only having six points against Pittsburgh, he would finish Tuesday with a team-high 23 points, shooting 8 of 15. Rounding out the three headed monster was Elijah Hughes who had 17 points going 4 for 9 from beyond the arc. As long as these three are clicking on offense, they can keep Syracuse in just about any game. It can be a potent offense when they’re contributing for the entirety of the game.